What is it with us and the post-election Mitt Romney? Every few days brings a new snapshot of Romney apres la defaite for us to seize on and pass around—Mitt disheveled at the gas pump, Mitt the oversized boy on the rollercoaster, and today's latest, Mitt with an overloaded shopping cart at Costco, dressed in so curious a get-up—indoor shades and high-perched cap—that one can only hope it was an attempt at a disguise. Meanwhile, we pore over the Washington Post's front-page account of Romney's life in recuperation, in which we learn that Romney has been riding his bike around La Jolla (apparently he can endure the stench of bird droppings that has overwhelmed the town's shoreline), ordering Thanksgiving dinner from Boston Market, and generally faring slightly better than his wife Ann, who, her friends told reporter Phil Rucker, "believed up until the end that ascending to the White House was their destiny" and "has been crying in private and trying to get back to riding her horses." Our fascination with these images and tidbits is especially remarkable given that for most of the year-long campaign, Romney held so little interest for all but the most hard-core of news junkies. BuzzFeed went so far as to run an article in June about Romney's negative impact on Web traffic. "No one wants to read about Mitt Romney," wrote McKay Coppins. "The well-starched Republican's traffic poison has been felt this year at websites across the political spectrum—including at BuzzFeed—and it's left many editors, publishers, and bloggers yearning for the days of the unpredictable Sarah Palin, the maverick John McCain, and the Obama-Clinton blood feud." So what gives? Why do we now pounce on sightings of the man who once provoked a communal snore? 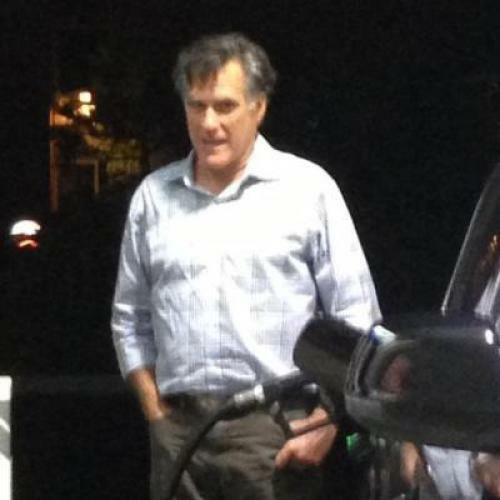 Perhaps it is that we feel we are finally being afforded a look at the real Romney behind all the polish and artifice—indeed, "friends" told Rucker that the photo of Mitt at the gas pump is "just how he looks without a suit on his frame or gel in his hair." But this alone can't explain our fascination. After all, the Romney campaign did its best to offer hints of the unvarnished Mitt throughout the campaign as proof of his, well, humanity, by leaking a photo of him doing the laundry in a hotel basement, allowing photographers to catch him in granddaddy in repose mode at Lake Winnipesaukee, and telling all the world about his bulk-purchase-minded thriftiness. I suspect it goes to something more fundamental in the human psyche: our fascination with fate. Put bluntly, it's rare in this day and age for us to witness a divergence of outcome as radical as what has just occurred with Mitt Romney. Here was a man who was awfully close—if not as close as he thought—to being elected leader of the free world. If a few hundred thousand votes had swung a different way in a few key states, he would have been presiding over the reshaping of the American tax code and federal budget in the year to come, dismantling the biggest piece of domestic policy legislation in more than three decades, and taking the reins on confronting Iran's mullahs. A special Secret Service team—code-name Hawkeye Javelin—was standing by on Election Night in Boston to swoop in and supplement protection for the president-elect. Instead, the agents melted away, and Romney was driven home by his son Tagg. This is a twist of fairy-tale-level order that we get occasionally in Hollywood (the crashes of Lohan, Sheen, etc.) and in sports and the courtroom, but which is relatively rare in politics. Many high-profile losers manage to escape, or at least lessen, the air of defeat by seeking protection in the stature of their existing job, as John McCain has done since 2008. Others seek rebirth and come back in new positions, as Hillary Clinton has done. The closest recent parallel to Romney is Al Gore, and indeed, there was plenty of mirth after the 2000 election about Gore's transformation into an overweight and hirsute exile in Tennessee. But our fascination with post-election Romney seems of a different order. It may be simply that we are getting more such glimpses today thanks to the Internet and its TMZ-feeding shock troops than we were a decade ago. But there's also an intrinsic difference between the nature of the two candidates and their defeats. With Gore, there was the heavy air of tragedy stemming from his wrenching popular-vote victory-turned-defeat, which made his post-election decline slightly hard to watch. With Romney, there is no great pathos to burden our voyeurism. If anything, the images of his life in defeat seem affirming in some sense: here is someone who lost who is actually going around and behaving like someone who lost. We haven't had much of that these past few years. Those of Romney's fellow financiers who led us so badly astray on Wall Street have, all too often, continued to strut the stage like winners; Karl Rove's still got his column in the Wall Street Journal even after blowing through all that money at Crossroads and melting down on Fox News on Election Night. But Romney, who had so many harsh things to say about the losers in the game of life, is, to his credit, acting and looking like a man who has been defeated. He's buying paper towels in bulk, and we, watching from the cheap seats of our national ampitheater, gladly assume that he needs them to mop up all the tears.